My Girlfriend was round her friends house having a girly night in. They went to her bedroom to chill out for a bit when an interview came on the TV. It was an interview with the 16 year old English diver, Tom Daley, for the 2012 Olympic games. The girls, for some unknown reason, wanted to take a picture of him on this show. They tried to take the picture a couple of times after missing and getting the presenter the first few. 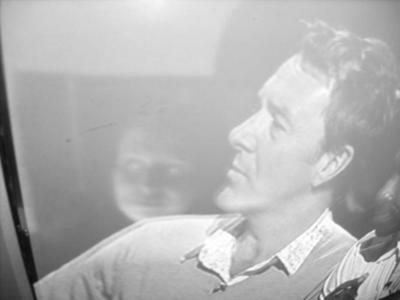 When they looked at the picture of the presenter that they had taken they noticed a clear face in the background. There was no audience on this show and the girls, unfortunately are not actually clever enough to fake a picture like this. trust me I know! Also in case you may think its a reflection, the face looks nothing like the two girls. Its a creepy picture and I am quite the skeptic so to be honest I was very surprised when I saw this picture. And after seeing it I cant help but think, maybe there are things that go bump in the night! hope that doesn't happen in my TV. I'll never watch it again. Thought it was probably just reflection, but on enhancing contrast and such it appears the face is actually BEHIND his shoulder. The line between shoulder and face is unusually straight and unpixellated, but that could be just the way it scanned. This looks crazy. This picture made a believer out of me. Just the way her eyes are, looks evil. Wow . Even I Am Shocked ! I'm the debunker. That's what I'm known for. I always use the logic and figure out the mysteries. But this . . . Has me caught. Great picture! It is whoever took the pictures face. Makes my heart thud.... Uggg! When I first looked at that I swear my stomach flipped over! I was expecting another one of those lame blurs but that is FREAKY!!! That freaked me out, there is no way you can fake that, I am now a believer. That is one freaky picture. The face on the TV screen looks evil.